The continued rejection of racial mixing lies in deep-seated notions of racial difference and maintenance of racial boundaries. In the U.S., we are still highly segregated in our neighborhoods and friendship circles. Even in our favorite TV shows and movies, interracial couples are infrequent, and biracial children even rarer. Most individuals will maintain that race does not matter in terms of who they work with or are friends with. But despite that, it remains socially acceptable for us to discriminate in terms of who we date. Most whites will not admit they do not want a black neighbor, but will freely admit their racial preferences in dating, referencing physical attraction and lack of cultural similarities as reasons not to consider dating anyone of another race. Erica Chito Childs, "Williams's Pregnancy Proves Interracial Couples Still Aren't Accepted," Fortune, May 3, 2017. http://fortune.com/2017/05/03/serena-williams-pregnant-fiance-alexis-ohanian-photo/. Western Michigan University History Professor Mitch Kachun says his book is about Crispus Attucks, one of the men, killed at the Boston Massacre in 1770. But he says First Martyr of Liberty: Crispus Attucks in American Memory also raises questions about who’s included in history, and who is ignored. Attucks himself was ignored for long periods of American history. Kachun says while the Boston Massacre was remembered in the 1770’s into the 1780’s, those killed were rarely mentioned by name. But Kachun says around the time of the 50th anniversary of the signing of the Declaration of Independence, more attention was paid to the role of the working class in the American Revolution. Then as the anti-slavery movement became more active, the story of the mixed-race man killed in 1770 was told more often. By the end of the 1840’s and in the 1850’s, Kachun says Attucks was often referred to as a figure in the Revolution. Read the entire article here. Listen to the interview (00:29:27) here. 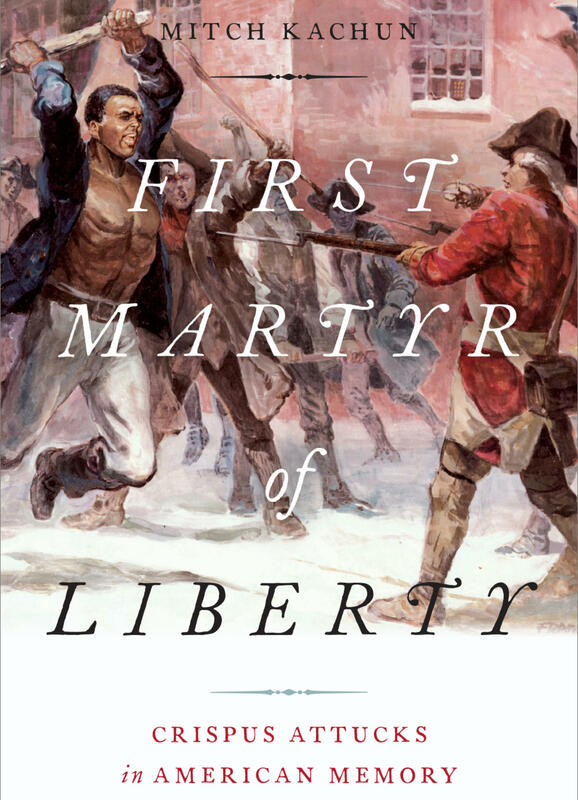 First Martyr of Liberty explores how Crispus Attucks’s death in the 1770 Boston Massacre led to his achieving mythic significance in African Americans’ struggle to incorporate their experiences and heroes into the mainstream of the American historical narrative. While the other victims of the Massacre have been largely ignored, Attucks is widely celebrated as the first to die in the cause of freedom during the era of the American Revolution. He became a symbolic embodiment of black patriotism and citizenship. This book traces Attucks’s career through both history and myth to understand how his public memory has been constructed through commemorations and monuments; institutions and organizations bearing his name; juvenile biographies; works of poetry, drama, and visual arts; popular and academic histories; and school textbooks. There will likely never be a definitive biography of Crispus Attucks since so little evidence exists about the man’s actual life. While what can and cannot be known about Attucks is addressed here, the focus is on how he has been remembered–variously as either a hero or a villain–and why at times he has been forgotten by different groups and individuals from the eighteenth century to the present day. While the figure of the “tragic mulatta” is writ large in American literature and literary criticism, this essay shares a recognition most recently advanced by William L. Andrews and Mitch Kachun: “What is remarkable though not always acknowledged . . . is the fact that the majority of beautiful mulattas in American novels before 1865 . . . do not end up unfulfilled” (xliii). Andrews and Kachun note that Metta Victoria Victor’s Maum Guinea, H. L. [Hezekiah Lord] Hosmer’s Adela [The Octooon], John T. Trowbridge’s Neighbor Jackwood, [Thomas] Mayne Reid’s The Quadroon, and E. D. E. N. Southworth’s Retribution feature mixed-race female characters who, though they “must endure a stint in slavery and withstand intimidation by lascivious slave owners and brutal overseers,” “more often than not . . . eventually encounter a northerner or a European on whose love they can rely” (lxv, n. 45; xliii). While it is still too early to make judgments about “the majority”-especially given that Andrews and Kachun’s own work illustrates that we need to be hesitant about assuming any “complete sets”-this essay shares the sense that mixed-race characters who are not “tragic mulattas” have been absent from our discussions for too long. This absence is complicated by the disproportionately larger presence in our scholarship of archetypal examples of the tragic mulatta type in works such as Lydia Maria Child’s “The Quadroons,” William Wells Brown’s Clotel, and Elizabeth Livermore’s Zoë, even though these works were neither more popular nor exceedingly better than some of the novels noted by Andrews and Kachun. The reasons for this imbalance are complex and beyond the scope of this essay; it may come in part from Child’s early imprint on a vast amount of antislavery literature (including Brown’s story) and in part from the limited senses of racial definition that have dominated much contemporary scholarship. Regardless, the dominance of the figure of the tragic mulatta in our scholarship has limited our consideration of race and racial identity. This imbalance seems to me, for example, to be partially to blame for Lauren Berlant’s dismissal of the full range of types of political efficacy available to mixed-race characters-a formation scholars such as P. Gabrielle Foreman have challenged when applied to Black women’s texts. It has also, among other gaps, led many of us to locate the first real resistance to the figure of the tragic mulatta in works such as Child’s Reconstruction-era Romance of the Republic and Frances Ellen Watkins Harper’s Iola Leroy. This essay thus begins by acknowledging that there were several early examples of a discourse of mixed-race heroines running counter to the figure of the tragic mulatta-one in which the mixed-race heroine not only avoids a tragic end but actually embraces her genealogy, uses her visual racial indeterminacy to aid nation-building and self-empowerment, and finds fulfillment in a multi-racial family housed within the larger Black community. Specifically, I examine two previously unknown mixed-race heroines who are ultimately far from tragic-indeed, who seem almost consciously constructed as revisions to the tragic mulatta type. This essay argues that, in different ways, the protagonists of both Levina B. Urbino’s Sunshine in the Palace and Cottage (1854) and Louise Palmer Heaven’s In Bonds (published in 1867 under the pseudonym Laura Preston) explode many of the expectations of the tragic mulatta type. Through this work, I hope to begin to re-imagine the contours of our sense of the mixed-race female character (tragic mulatta and otherwise) in American literature.